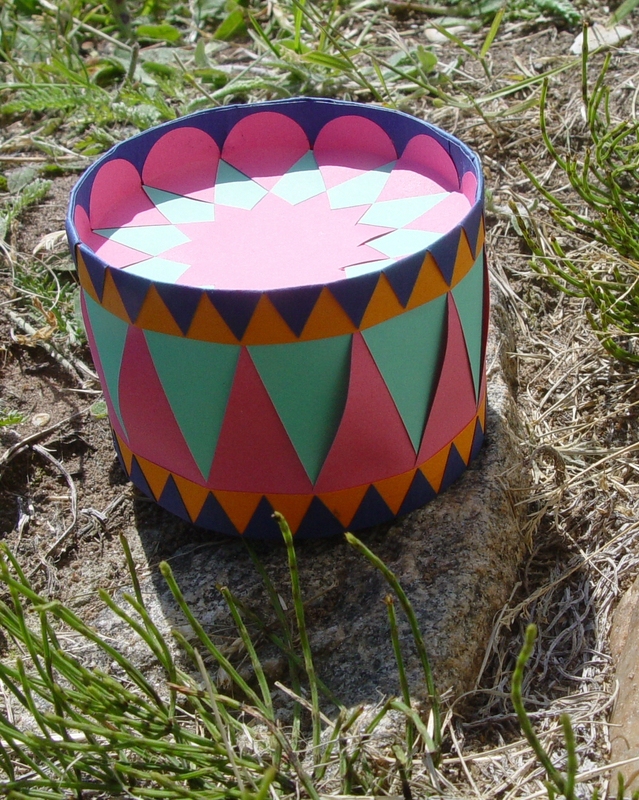 This woven drum involves a little easy weaving and quite a lot of gluing. First you cut out the necessary pieces. 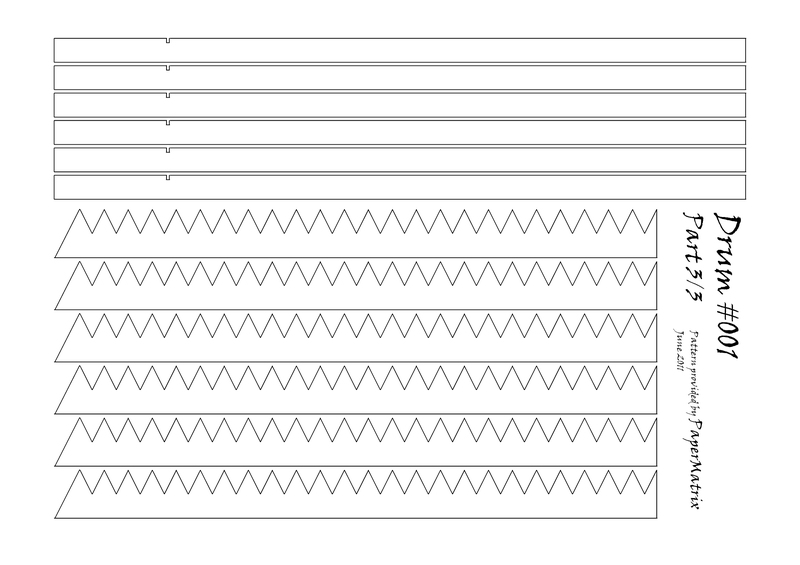 You need to cut out the forms in “Part 1/3” and “Part 2/3” in two contrasting colours. 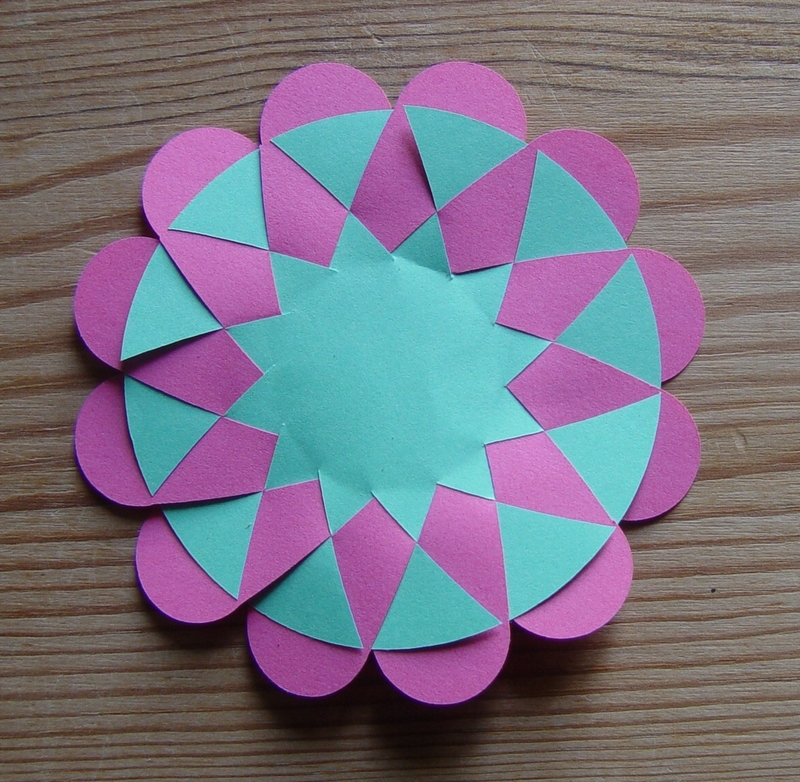 In the example I used pink and turquoise. Then you need two of the simple strips from “Part 3/3”. I used orange. 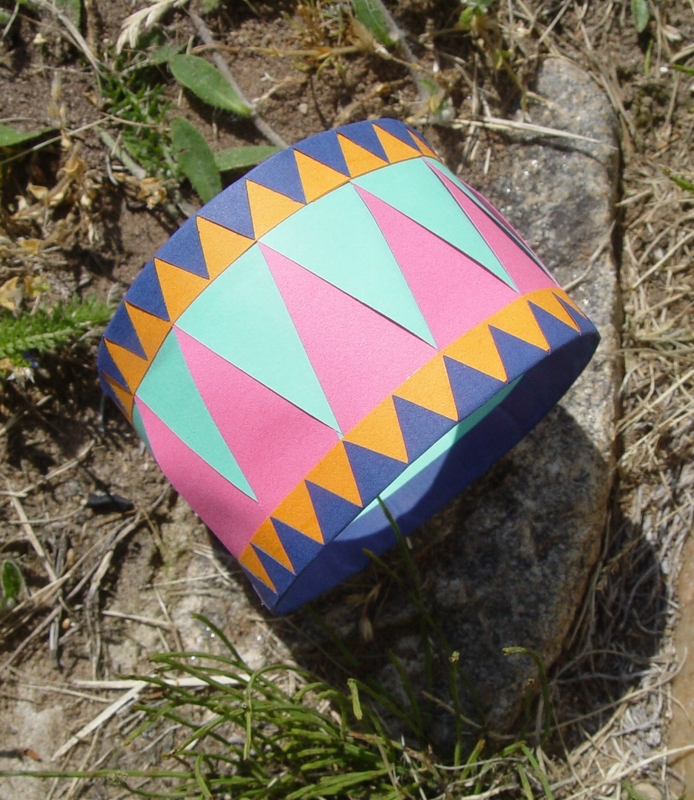 And finally you need two of the simple and two of the zigzag strips from the same sheet. I used dark blue. First make the body. 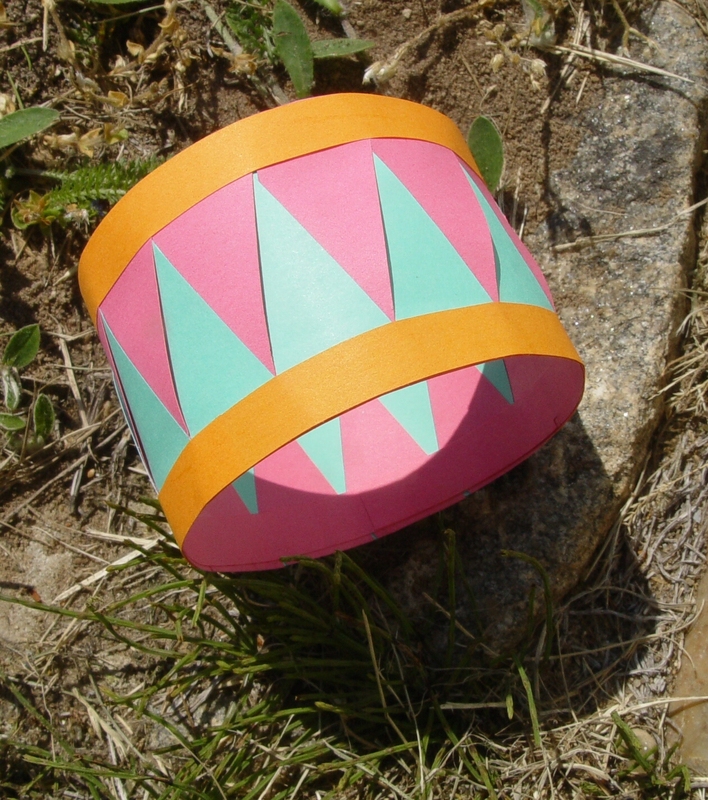 You start making two rings from the large pink and turquoise pieces. One should be a little larger than the other. Use the small notch as guide. One should have a diameter not showing the notch, the other should show. 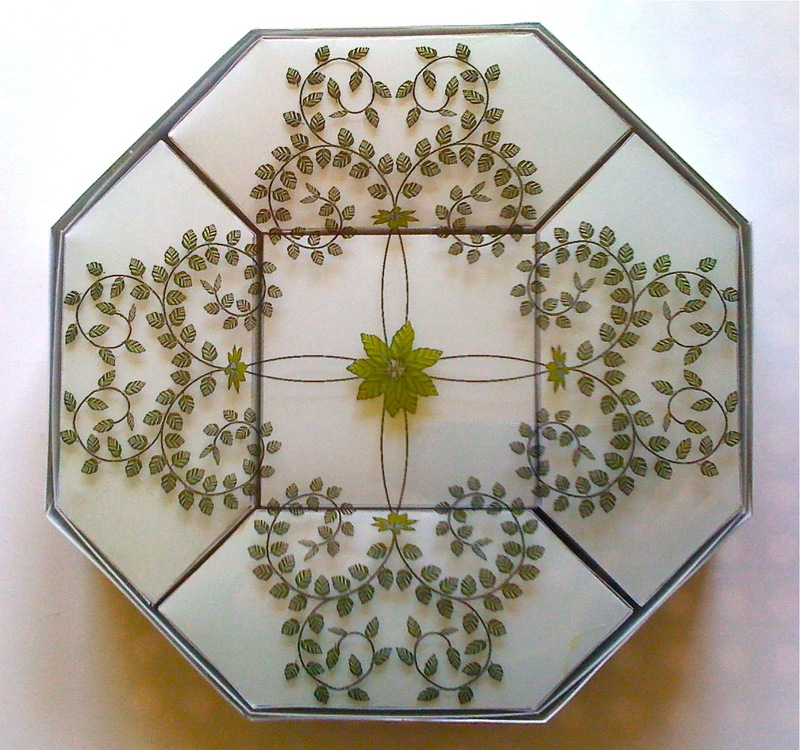 Place the smaller inside the larger and weave. Make sure to start at the base of the cut. Go around the circle and fix with paper clips (cf. picture). 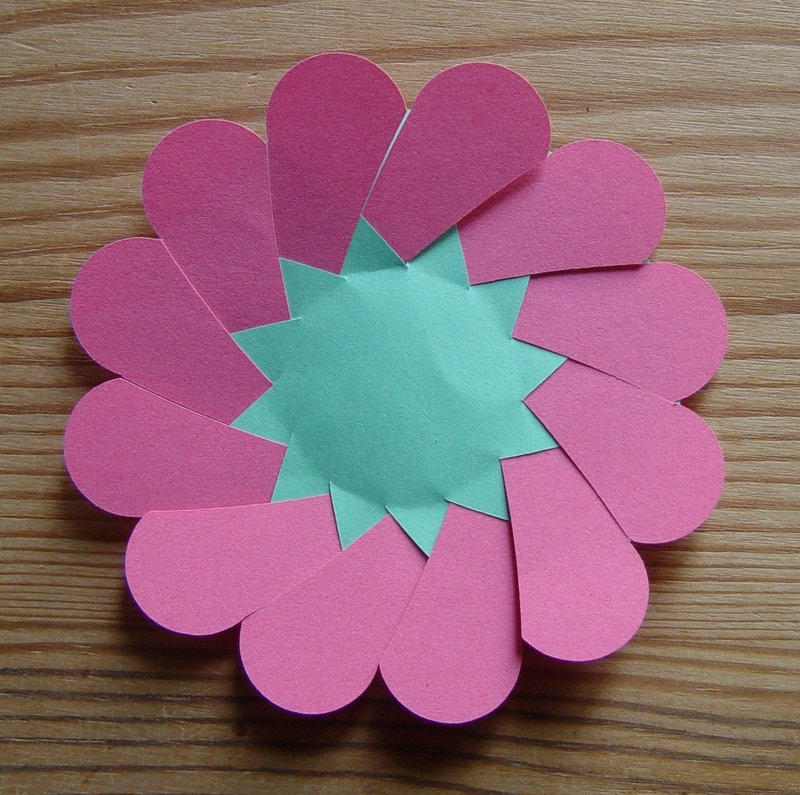 Make a circle from the simple pink strip. The diameter should be just such that the notch does not show. 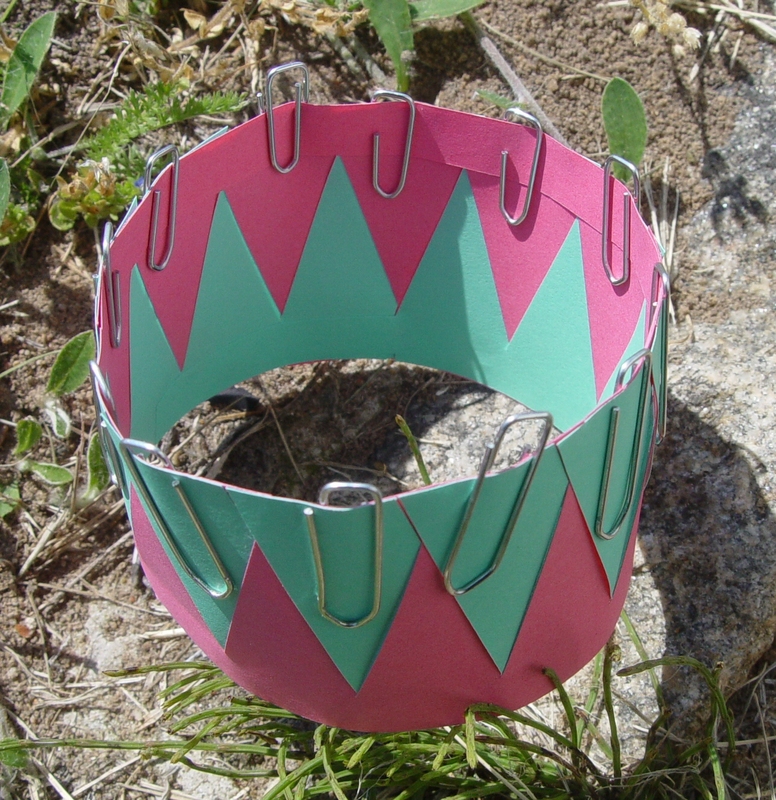 Place the ring inside the woven circle and fix with the clips. 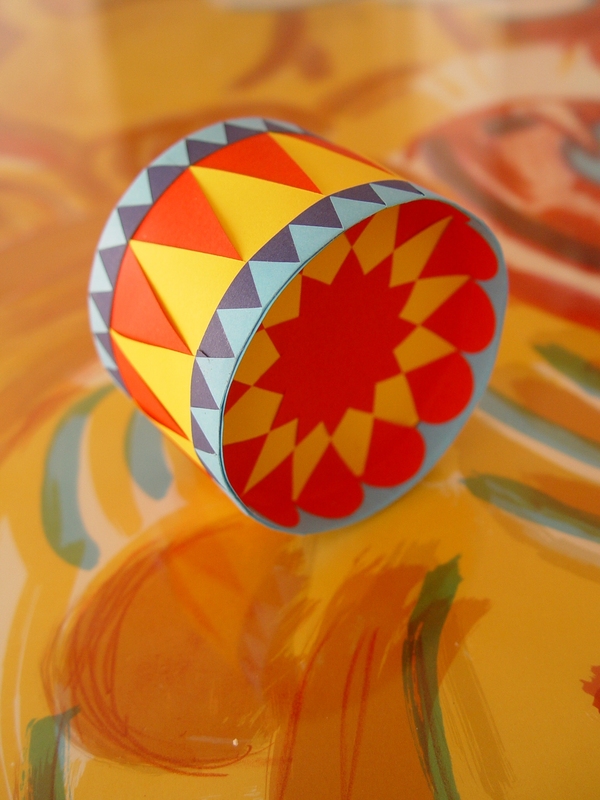 Distribute the woven strips evenly around the ring and fix with glue. Now fix the two simple orange strips along the body’s edges. Make sure that the orange overlap fits exactly (cf. picture). 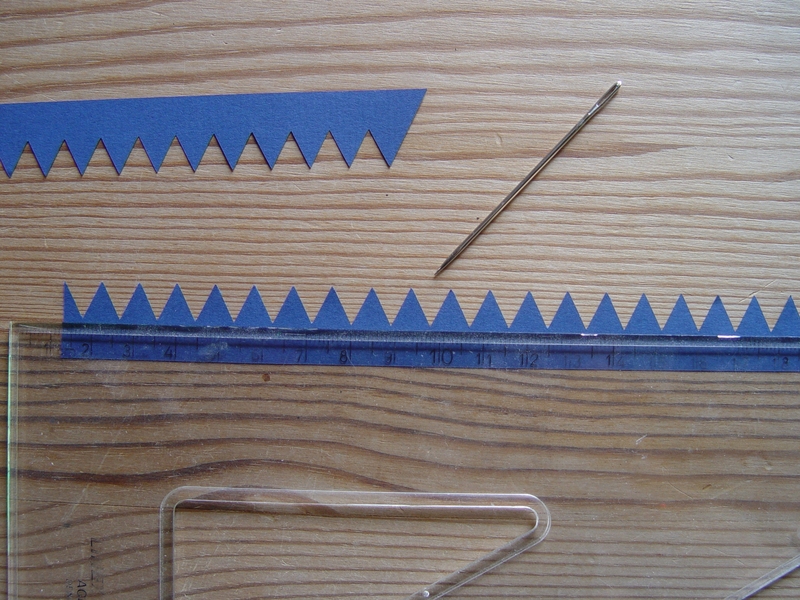 Score the dark blue zigzag strips along the spine (cf. picture). Fix them to the body placing every second point exactly above the pink/turquoise points (cf. picture). Fold back the upper part of the strip and fix it to the inside of the body. Take care to flatten any creases. Now make the drum skins. 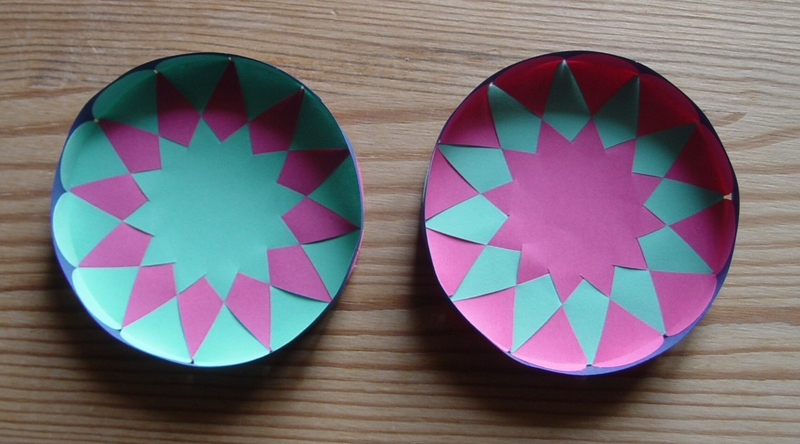 Take two different circular pieces in different colours and place them flat with the larger one below (cf. picture). 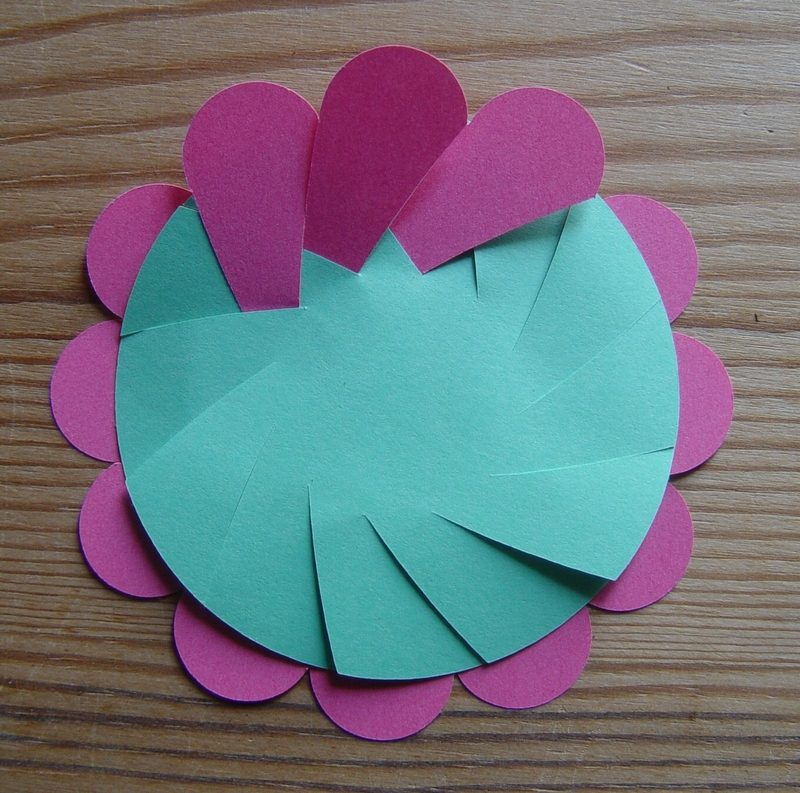 Then weave making sure that you start at the base of the cuts by rotating the two pieces in opposite direction (cf. picture). 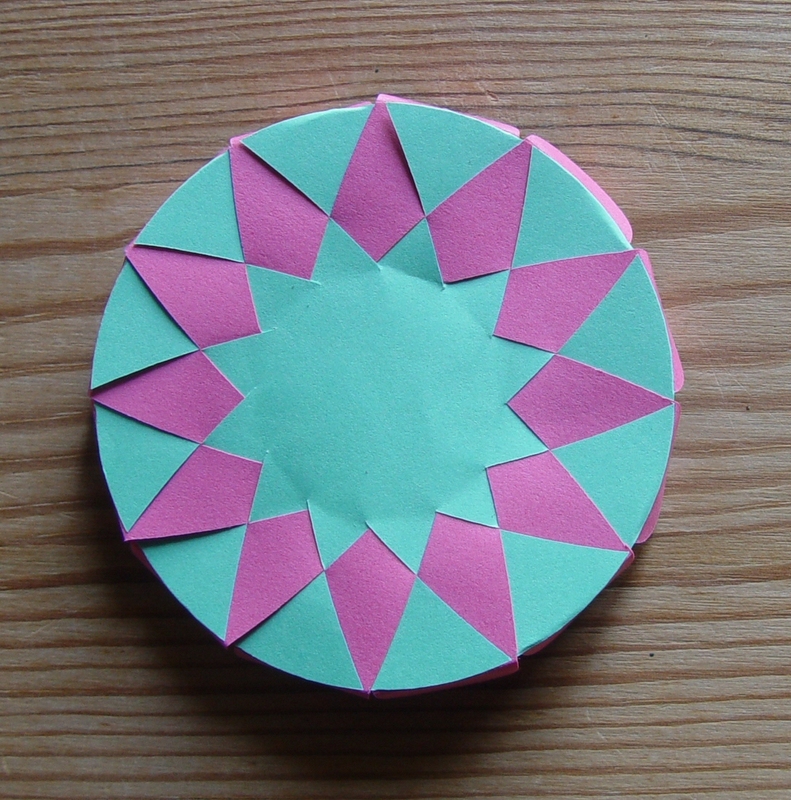 When you like the star form fix it by weaving the next circle. 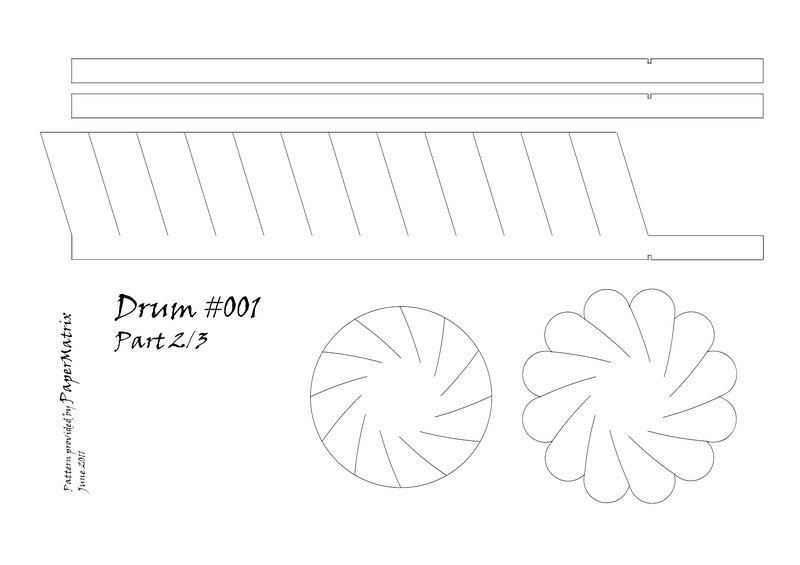 Place the drum skin flat and score along the brim of the inner piece. Fold back (cf. picture). 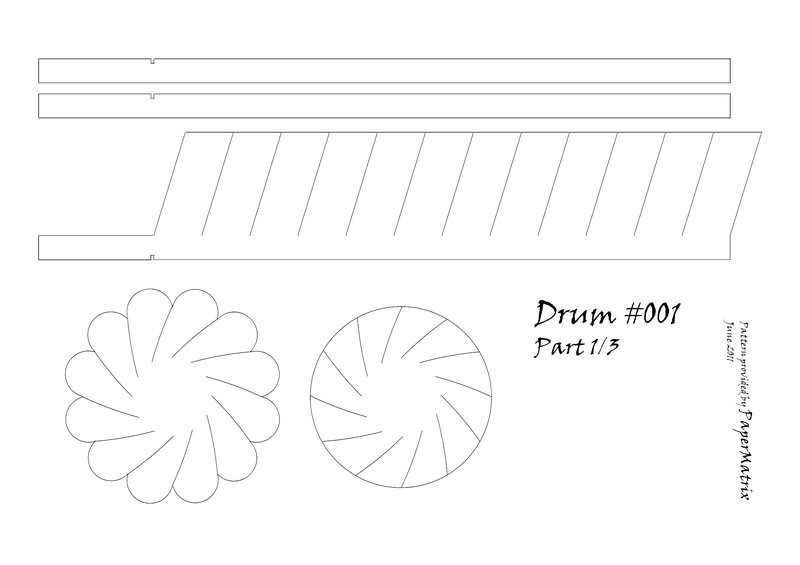 Make the other drum skin in the same way. Prepare rings from two simple two dark blue strips. 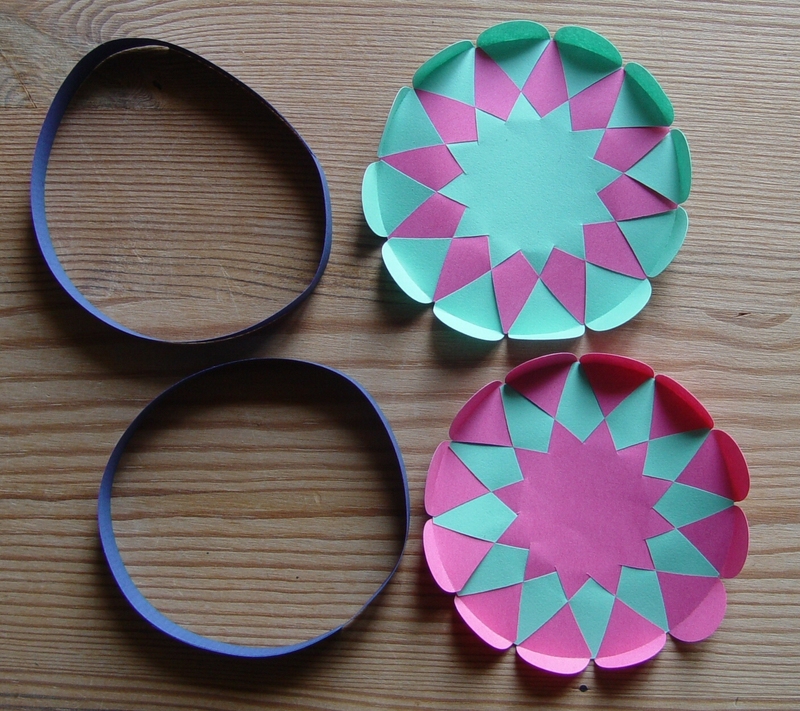 The diameter should be smaller than the other rings you have made. Make an overlap of the same length as the width of the notch. The overlap should be on the outside. Fix the small half circles one by one to the inside of the ring. Keep an eye on the distance between the circles. It should be less than 1 mm to make room for all without overlap (cf. picture). Finally fix the two drum skins inside the body. Make sure that the points of the star point towards the points at the body. Hvor er den utroligt flot, og den ser ud til at kunne laves selv med mine fumlefingre. Du kan nu ikke være helt så fummelfingret, i betragtning af hvor fine de komplicerede æsker, du selv opfinder, ser ud.